For over 20 years, you have enjoyed our homemade Jambalaya at the Crawfish Fest. Now YOU can make it at home! 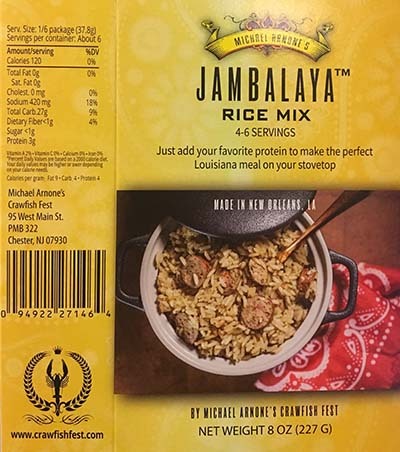 Our new Jambalaya Mix has all of the same spices and seasonings you have come to love. Easy to follow directions are on the package; just add your favorite sausage, meat or seafood. Case sales only. Each package feeds about 4 people. Price $18.00 per case of 6/8 oz packages, plus $10.85 shipping per case to Lower 48 States. Shipping via UPS Ground. UPS will not deliver to a Post Office Box. Jambalaya Shipping only. Log into your account to print your tickets. Tickets will not be mailed.